A bi-fuel system uses two types of fuel, but the fuels are not mixed together during operation. The engine is capable of switching between the two so that it is always using the type of fuel most efficient for the conditions at hand. Some of these engines are automatically controlled by a governor, which switches between the two types of fuel when that specific fuel is the most efficient choice. Other bi-fuel engines allow the operator of the machine to switch between the two fuels at will. These engines are capable of using either fuel exclusively in the absence of the other fuel source, but will operate less efficiently when the right fuel isn’t available. Some bi-fuel generators use LP vapor and natural gas as the two fuel sources. Others switch between operating on natural gas and regular gas, or natural gas and diesel fuel. Different fuels are used for different applications, such as hybrid vehicles, generators, or other consumer or industrial appliances. A dual-fuel system is capable of using two types of fuel at the same time in a mixture. It usually cranks up on one type of fuel, and a governor built into the system gradually adds the secondary fuel source until the optimal mixture of the two fuels is achieved for efficient running. Like the bi-fuel system, a dual-fuel system is usually capable of operating on just one of the fuel sources in the absence of the other. However, in many of these engines only one of the fuels is capable of starting the engine. For example, a dual-fuel generator starts by using diesel fuel and gradually adds a mixture of natural gas fuel. The diesel ignites at a mere 500-700 degrees Fahrenheit. However, the natural gas will not ignite until temperatures reach 1,150-1,200 degrees Fahrenheit. So, once the engine starts it can run on natural gas only or diesel only. But natural gas can’t be used to start the engine because the diesel fuel is necessary to bring temperatures up to the point at which natural gas will ignite. Not surprising, the confusion between the terms comes from the government’s definition. The Department of Energy, uses them the opposite way of how most industries define them. But once you understand the concepts of bi-fuel and dual-fuel systems, it is quite easy to determine which is meant to refer to a specific system. Also, bi-fuel systems and dual-fuel systems are often used in different applications, which gives us another reference point. The definitions used in this article are those used by the Department of Energy, and may not apply to all consumer or industrial products in the same way. Simply put, when you shop for an engine, find out whether the fuels are used in a mixture or separately. Then you’ll understand which type of engine you’re dealing with. Be sure to understand whether the engine can use either fuel to crank up, or if you need both fuels to start the engine. Also, shop for an engine that is specifically designed for your particular uses. The most popular use of the bi-fuel system is in hybrid automobiles. Most hybrids are capable of storing both natural gas and regular gasoline or diesel fuel. So, the hybrid vehicle is programmed to inject the accelerant-efficient diesel fuel into the engine until a steady speed is reached, and then the engine transfers to the more efficient natural gas. These engines are designed so that if one fuel source is exhausted, the engine can continue to operate on the fuel source that is still available. Bi-fuel systems are also useful in consumer grills, residential heating systems, ovens and ranges, and generators. 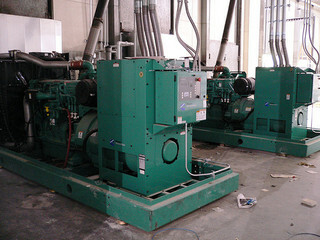 Both consumer and industrial grade generators are available with bi-fuel systems. The greatest advantage of a bi-fuel system is that the most efficient fuel for the task is always being used, so these systems are significantly more efficient to run over time, compared to a single-fuel engine such as a gas-powered car. Dual-fuel systems cost significantly more than traditional engines to buy, usually carrying a price tag 15-30 percent higher. But since the engine is capable of running on a single fuel or a mix of fuels, it is less costly to run over time. Plus, dual-fuel systems eliminate the need for large-scale on-site storage of expensive fuels, such as diesel. It also lowers the maintenance costs of diesel storage, and is more reliable because if the source of natural gas is temporarily cut, the engine can continue to operate on diesel alone. Usually, the most efficient use of fuels within this system is a mix of 75 percent natural gas to 25 percent diesel fuel. If the engine load increases, the governor will add a higher ratio of diesel and readjust the natural gas-to-diesel ratio until the engine is operating at peak efficiency. Not all duel fuel systems use a diesel-natural gas mixture. Some, such as the E85 compatible vehicle, use a mixture of ethanol and gasoline. The optimal mixture of these fuels is 85 percent ethanol to 15 percent gasoline. Dual-fuel systems are also used for non-transportation engines, including generators and drilling rigs. Fewer consumer products use dual-fuel systems because most of these engines are used in industrial applications and as emergency power back-up systems. To clarify, both systems use two fuels, but the bi-fuel system uses just one fuel at a time, whereas the dual-fuel system uses a mixture. So if there is ever a doubt about whether you’re getting a bi-fuel or dual-fuel product, as defined by the Department of Energy, simply find out whether the fuels are mixed during operation (dual-fuel) or if the system changes between one fuel and the other (bi-fuel).